May 23 protest in Oakland. SFPD learned its lesson, such that over the last ten years, San Francisco has paid zero in protest-related police misconduct settlements, while Oakland has paid more than $10 million. In 2003, when it was already under a federal consent decree for police abuses and corruption, OPD responded to an anti-war demonstration at the Port of Oakland by shooting protesters and longshore workers alike with “less lethal” munitions. The NLG and ACLU sued, and worked with OPD to draft a comprehensive Crowd Control Policy that spells out when and how police may stop a demonstration. But OPD repeatedly violated this policy when Oaklanders took to the streets after the 2009 killing of Oscar Grant and during the 2011 Occupy movement, arresting scores of demonstrators without giving them an opportunity to disperse and shooting dangerous munitions at them. During an Occupy demonstration, an OPD officer shot young Marine veteran Scott Olsen in the head with a lead-filled “beanbag,” shattering his skull and permanently destroying part of his brain. As Olsen lay on the pavement critically injured and bleeding from the head, another officer lobbed a teargas grenade into the group of Good Samaritans who were rushing to Olsen’s aid. At another demonstration a week later, an officer beat a man so badly that his spleen was ruptured. The NLG sued again to enforce the Port settlement agreement. In 2013, OPD and the City of Oakland again agreed to abide by the newly strengthened Crowd Control Policy, which again became a federal court order. The policy seeks to minimize confrontation between police and protesters, giving the police a rational framework to protect persons and property while upholding the right to demonstrate and avoiding civil rights violations and further liability. The mere failure to obtain a permit is not a basis to stop a march and make arrests under OPD’s Policy. Commanders are given factors to consider in determining whether a street march presents a serious enough traffic problem or other issue to warrant making mass arrests, which often tie up traffic far longer than a moving march. After continued concerted effort by the NLG, and as OPD sought to get out from under its thirteen-year-old federal consent decree, OPD’s protest practices were finally improving in the months prior to the mayor’s misguided intervention. The mayor’s crackdown on protests began on May 21, 2015, at a peaceful march intended to bring attention to police killing of Black women. Pursuant to its Crowd Control Policy, OPD has routinely facilitated street marches. Starting with the May 21 #SayHerName march, the police prevented demonstrators from walking in the street after dark — despite the fact that there was no hint of property destruction or unlawful activity of any kind. The repression continued when demonstrators came out to break what they termed the “protest curfew” that weekend, on May 23 and 24, in a similarly well-organized and peaceful fashion. Although OPD allowed the marches to proceed briefly, they interfered with the march by making repeated, obnoxiously patronizing announcements at such high volume as to be deafening, and by following the march so closely as to force marchers at the back to walk very quickly or run in order to avoid being pushed or arrested for walking too slowly. On each of the three evenings so far, when darkness fell, OPD stopped the marches with lines of officers and ordered demonstrators to turn around. On May 23, for example, the protesters’ police liaison had communicated to police that the activists would nonviolently defy an order to get off the street. The police blocked the march from going forward, and then declared an unlawful assembly when marchers linked arms and tried to walk forward, and then sat down in the street. In response, the police deployed explosive chemical agent grenades and pushed and shoved the women who were at the front of the march, and could not move back due to the crowd behind them. This is exactly the type of police-created unlawful assembly and unnecessary physical confrontation that inevitably leads to illegal arrests and injuries, and which the OPD Crowd Control Policy is designed to prevent. 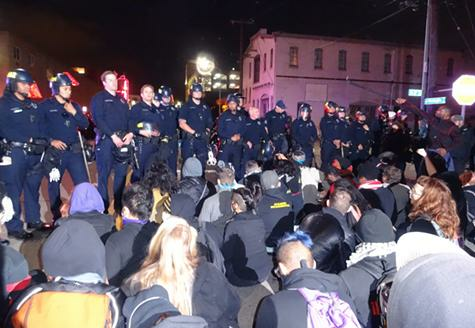 Mayor Schaaf’s directive has shattered any bit of goodwill that may have been developing between Oakland protesters and police, while doing nothing to actually address the concerns of business owners. Preventing demonstrators from marching and forcing them onto the sidewalk will only lead to more, not fewer, broken windows. Most importantly, it is telling that Mayor Schaaf reserves her ire for broken windows, while not showing the same concern about police killings and abuse of people of color, or the trampling of the First Amendment. Political gains that have been made by Black people and other oppressed groups in this country have come about at least in part through unruly demonstrations. Banning protest may seem a quick fix, but is not worth the cost to taxpayers or the cost to democracy. And it won’t work. As long as the police are allowed to function as an occupying force in poor neighborhoods and communities of color and take lives with impunity, and the local governments repress those who speak out in response, we can be sure resistance will continue to grow. The NLG is preparing to go to court to enforce the Oakland Police Crowd Control Policy and the federal court settlement order. Rachel Lederman is the president of the National Lawyers Guild, San Francisco Bay Area Chapter, and a civil rights attorney. She is the lead counsel in Spalding v. City of Oakland, the litigation in which the United States District Court has retained jurisdiction to enforce the Oakland Police Crowd Control Policy.